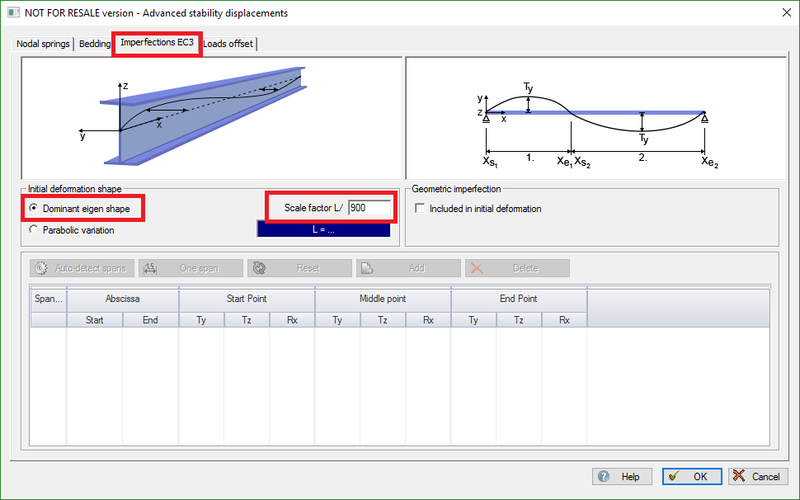 The Imperfections tab from the Advance Stability solver implemented in Advance Design lets users specify the imperfections taken into account when performing second order analysis on steel members. The imperfections are introduced as initial deformations. Their shape is given by the dominant eigenmode (eigenmode with smallest eigenvalue). Their magnitude is given by scaling the eigenmode with the ‘Scale factor’ user-parameter. The default value of the scale factor is set to L/900. This value may seem lower than the usual amplitude of the geometrical imperfections as given by Eurocode 3 (§5.3.2 from EN1993-1-1) because residual stresses are taken into account, but it can be changed by the user depending on the member being subjected to sway or bow effects. The use of this reduction factor is usually restricted to members in pure bending, with second order effects, warping of the cross-section, eccentricity of the load from shear center and lateral restraint conditions properly taken into account. Checking the ’Included in initial deformation’ option has little impact on the Advanced stability feature itself. It is only meant to grey out or not the ‘Local bow imperfections…’ option from the member Properties sheet. the ‘Local bow imperfections’ property will be disabled and greyed out in the element Property sheet so as to ensure that no additional loads are generated on the global model. If the ‘Included in initial deformation’ option is checked, there is no need to simulate the bow imperfections with equivalent forces. the user should not forget to activate the ‘Local bow imperfections…’ option in the Property sheet of the element if he/she expects Advance Design to introduce them as equivalent forces on the global model. If the ‘Included in initial deformation’ option stays unchecked, the user has the ability to activate the geometric imperfections in the property sheet. In other words, if the geometric imperfections are already introduced in the global model via equivalent forces, then a smaller ‘Scale factor’ value can be assumed (e.g.’L/900’), as residual stresses are explicitely taken in to account (therefore the ‘Included in initial deformation’ option can be left unchecked). Geometric imperfections taken in to account on the global model allows for a smaller scale factor (e.g. ‘L/900’). However, introducing the geometric imperfections on the global model via equivalent forces and imposing a large ‘Scale factor’ (e.g. ‘L/150) for the eigenmode-based initial deformation would seem excessively conservative. The ‘Parabolic variation’ part of the dialog allows specifying a user-defined deformation which will be be introduced as direct imperfection. The ‘Scale factor’ parameter is then greyed out as the values introduced by the user are already in displacements units (e.g. centimeters). Keywords: imperfection, EC3, Advance stability, second order, stability, 2nd order, parabolic variation, scale factor, geometric imperfection, included in initial deformation, dominant eigen mode, initial deformation shape, auto-detect spans, one span.